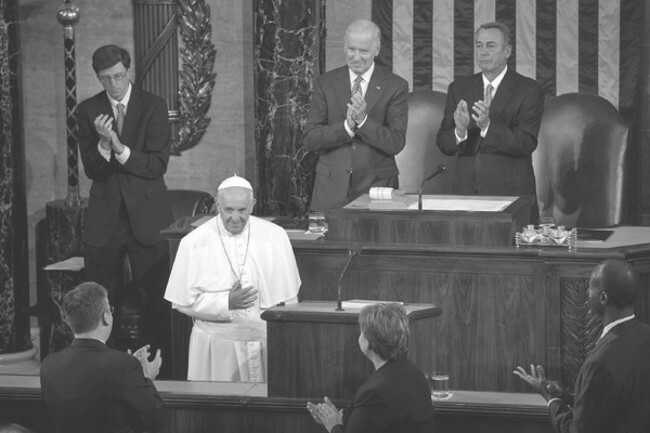 Pope Francis told Congress we need to care for the environment. And in people’s minds, and in his encyclical Laudato Si’, this means at least acknowledging the threat of man-caused global-warming-of-doom. Support by the pontiff for this cause cheered many environmentally minded. The Holy Father also said that we should welcome immigrants. And this pleased those who champion open borders. And so on for comments regarding wealth inequality, the death penalty, and other matters well known to us all. Result? Environmentalists, for instance, are using the Pope’s authority as an argument that their (also well known) environmental policy positions should be adopted. And perhaps it is true that the Pope is an authority on these matters. He is, after all, the Pope, and he might just have a more direct line to the Ultimate Source. It’s possible. But if we accept the Pope’s guidance here, it implies we should take the Pope’s direction on all the matters on which he advises us. After all, you can’t pick and choose. How could you? After all, how much secular authority does he possess on the physics of cloud energy transfer and the economics of the welfare state? So why point to him unless you think he has potentially divine, or otherwise superior, insight? Seems that in order to avoid being a hypocrite, it’s either disregard the Pope on any subject in which he is not an expert, or take him at his all. And that is the Pope’s Bargain. Are we up for it? I am. I’ll willing to accept whatever the EPA says about waterways, the atmosphere, everything. And those items the left has on their shopping list? Income redistribution, open borders, and all the rest? Let’s all agree on these, as we must, if we are to be guided by Holy Rome. But then you, dear reader, and everybody else who leans on the Holy Father must acknowledge the Pope’s lead in ending all abortion, nixing any idea of gmarriage, upholding the primacy of the man-woman-child family, not tolerating homosexual acts, not tolerating divorce. Yet I cannot hide my concern for the family, which is threatened, perhaps as never before, from within and without. Fundamental relationships are being called into question, as is the very basis of marriage and the family. I can only reiterate the importance and, above all, the richness and the beauty of family life. It is in the Eucharist that all that has been created finds its greatest exaltation. Grace, which tends to manifest itself tangibly, found unsurpassable expression when God himself became man and gave himself as food for his creatures. The Lord, in the culmination of the mystery of the Incarnation, chose to reach our intimate depths through a fragment of matter. He comes not from above, but from within, he comes that we might find him in this world of ours. In the Eucharist, fullness is already achieved; it is the living centre of the universe, the overflowing core of love and of inexhaustible life. Joined to the incarnate Son, present in the Eucharist, the whole cosmos gives thanks to God. So full acceptance of the Eucharist and the Trinity is part of the price you must pay to keep your side of the bargain. And that means, if you aren’t already here, sincere conversion to the Catholic faith. Come on in! The holy water’s fine! And that’s sincere, mind. Sincerity means being dutiful. Attend mass, go to confession, pray, and all the rest. No abortions, no contraception, no divorce, no sexual deviancy. That means those who are Catholic only in name, including many priests and bishops, have to convert, too. I think it a more than reasonable price to pay, for both parties. A truly equitable and, dare we think it?, holy compromise. It’s either take that compromise or give up using the Pope as an argument. The line forms at the rectory tomorrow. If the deal that is presented is that one must accept all that Pope Francis states, then I would reluctantly accept the climate hoax IF and ONLY IF all those supportive of Abortion were forced to desist from this evil practice, repent and beg forgiveness for the millions of murders committed since Roe v. Wade went into effect. I am willing to make that compromise. Yet, this is a false premise. All will listen to the Pope’s words and selectively choose a la carte which lessons to take and which to ignore. After all, why would Nancy Pelosi, a claimed-to-be Catholic, be such a supporter of abortion rights while at the same time accept Holy Communion on Sundays. There is no other explanation for this hypocrisy than selectively tuning in to the message. We as humans, it seems, tune in to the messages we want to hear and justify in our own ways why those aspects that are dissonant with ourselves need not be adhered to. But if we accept the [Pope’s] Bible’s guidance here, it implies we should take the [Pope’s] Bible’s direction on [all] ALL the matters on which [he] It advises us. After all, you can’t pick and choose. How could you? So now we see that global warming is not about science, but about faith. Bout time they fessed up. I was listening to a radio talk show yesterday where the usual progressive-type called and said it was okay to disagree with the Pope as long as it was something the caller also disagreed with. He didn’t say it those exact words, but the only disagreement he would allow was with his own pet ideas. Typical, hypocritical, selfish, short-sighted liberal ideology at its finest. You can add transgendering to the list. The Pope called it unnatural and an insult to God, I believe. Unless the church starts putting this message on billboards, the world is going to come to (if not already does) view the Pope and the Catholic church as worshipping Gaia and human beings, not God, and interested only in making money for themselves to be redistributed (after a reasonable cut) to those deemed in need. That’s not a church–that’s Communism. John Z.: Nancy Pelosi gets communion because the church fears her more than allowing evil into the church. Lack of backbone by the church. You are right that humans are basically hypocrites at every turn. This bargain assumes that the argument from authority is not a fallacy. But it is, so the bargain is nonsensical. Well, Briggs, you seem to be saying that not only Catholics, but others have to accept everything the Holy Father says as something to be acted on. But that “reductio ad absurdum” doesn’t work even for Catholics. It’s only when the Pope speaks “ex cathedra” on matters of faith or morals, that is in a communication which is explicitly intended to be a point of doctrine or dogma, that we have to follow his lead, and even then, as St. Thomas Aquinas pointed out, only if we can square it with our conscience after proper reflection and searching for the truth. The Pope has entirely turned his back on the guiding voice of his predecessors. He is in the mold of no other Pope in history. Unfortunately, the Pope, though wise and caring , is human and subject to the external and internal frailties of mankind from birth. Though he is head of the Catholic Church, he like the Protestant church leaders must depend on study of The Lord’s word within the Bible. The pronouncement of three persons in one God is questionable when Jesus said to His disciples “He who has seen Me has seen the Father; I and My Father are one. I see Jesus as the manifestation of our Lord Jesus Christ for all Christians. I always considered climate change to be the new Lysenkoism. It’s a shame the Pope is promoting it. No pope would be owed deference, therefore, when he contradicted Catholic teaching on the virtues of piety and justice to say that countries should allow themselves to be fundamentally altered by catastrophic levels of immigration. I don’t have much problem with a pope saying that we should care for our environment, though his merely personal opinions about the specifics of the scientific facts and even about the environmental policies (if they are not supported by clear requirements of moral theology), would not interest me in the least. But this man, Jorge Bergoglio fulfills only one of the requirements to be canonically elected (he is a male, so far as I know); otherwise, he is invalid on every other count. His public statements, his very public and constant heresies prior to putting on a white cassock and moving to the Casa Santa Marta, his publicly promulgated heresy in Evangelii Gaudium, etc., all confirm this. No Catholic owes him obedience or even deference, he is not only not a pope, he is not a Catholic and is not at all a member of the Church’s Magisterium. God help us, if he were! Catholics must get out of the lazy mentality that just assumes everything is fine in the Church, that the papacy can never go wrong, that we couldn’t possibly suffer an antipope in our days, etc. The history and dogmatic teaching of the Church are plain, and we have certain duties related to them. We aren’t allowed to be spectators in all of this. Now you how might have a sense of how traditional Anglicans feel, Cui. I pity those who jumped out of the frying pan in the Benedict era. Yes he mentioned family without describing it. Showing that you want to hear what you want to hear. He also mentioned the virtue of Dorothy Day who had an abortion. Argument from authority is an informal fallacy and can, therefore, be a correct argument. An informal fallacy is not always a fallacy but a formal fallacy, wherever it appears, is always fallacious. No one has to embrace every silly thing a religious person believes in order to agree with them about some particular issue. It’s the old broken clock/twice a day rule. Just because it’s 3 o’clock at the moment that does not mean I must accept that as the time for the rest of the day. Also, you’re taking something nice, here, and only adding really hateful unpleasantness. Why you have this need to make other people miserable is beyond me. Who are you too judge a gay person? Why would anyone care about what you think of their sexuality? On the other hand, if you were to shill for corporations who make more money by spewing more pollution into the atmosphere, wouldn’t you think someone should care about that? Get your moral priorities straight. Isn’t track record the big question? On questions of science, how has the Pope of the day fared down through history? In point of fact, hasn’t the Pope and Science in general been shown to be wrong on almost everything that was believed to be true in the past? So why believe things are any different today? If the past is any guide to the future, we can be almost 100% certain that everything we are told today by the “experts” will be found to be 99% wrong within the next 500 years. Who are you too judge a gay person? that is a question you should ask of the Pope? Didn’t Jesus say “Judge not lest you be judged”? Apparently the Pope is not bound by the teachings of Jesus. mysteries: Informal fallacies are so easily abused it’s incredible. The authority that one listens to MUST prove what it is teaching is correct. Their authority does not confer truth. It only ups the chances they are right, maybe. JMJ: No one has to agree with all, but if they do not, they cannot use the moral authority of a speaker to pretend to be right. In other words, if the global warming folks are calling the Pope blessed on climate change, then his moral authority is to be respected on ALL issues. If they are just saying (and they are not) that he’s a guy that agrees with them, then the stopped clock analogy applies. In this example, the claim is the clock is still running. I suppose we judge for much the same reason you do–because we have beliefs that are important to us. You’re are all about worshipping Gaia and socialism, some here worship a Christian God, some other gods, some not at all. You consistently deride commenters because they don’t believe the same way you do. How about YOU get moral priorities straight or stop being so judgemental. Sheri, it seems to me, Briggs and you are the buffets moralists here. The irony should be burning a hole right through your foot into your mouth. The Pope is Catholic and has not altered doctrine or faith. He’s within bounds to offer forgiveness. No Pope is infallible except on matters of faith and morals, and his teachings have not deviated. As for the Climate he appears to have been taken in by Climatologists. A lot of that going around. If they weren’t lying [and they are] being proper stewards of nature would be in line with Church teaching. But he has no authority or at least not infallible authority on the matter and it’s not binding. More worrisome is immigration. Jury is out and note I’ve long suspected the worse: that he sees himself as Wojtyla and America as the USSR. Note our putative Capitalist practices [they aren’t capitalists at all, unless you consider Trot banksters Capitalists] note these practices are indeed predatory and an Argentine would notice. Still not binding, this is a temporal matter.